Alain was 13 years old when he and his family fled the town of Bukavu, in South-Kivu province of the Democratic Republic of Congo (DRC). He doesn’t remember the exact date but early one morning his family heard a group of men armed with machetes speaking outside the front door of his family’s house. He overheard the men saying that his family was not Congolese. Alain grabbed a few of his belongings and with his family escaped. In the chaos of fleeing, his family of nine was separated. The family first fled South by foot from Bukavu to the city of Uvira, crossing the border of Burundi and then into Tanzania. It took them three days to get to Dar es Salam, which they managed to reach via train. They were told by members of one of the many churches they had stopped at along the way that there was a safe refugee camp in Malawi. Those same church community members put some money together for Alain and his family to continue their journey – heading west, they crossed over Lake Malawi into the town of Karonga and made their way to Dzaleka. Their journey was harsh. They went through bushes and crocodile infested waters. Alain and his family were robbed by people who took advantage of their situation, leaving them with barely any of their belongings. Back home, Alain was like any other active young boy. He attended high school and played soccer for the Bukavu Football Academy. He and his family lived comfortably. With ample food, his mother would sometimes distribute food to those in need. Alain remembers his mother’s words of wisdom about the power of giving and empathy: “She used to say that sometimes life changes, you never know what will happen tomorrow. Finally after their long and difficult journey, they finally found safety when arriving to Dzaleka camp. “When we went to register with UNHCR, the person was speaking of home, saying nobody will ever come to take you out of here, and they cannot hurt you,” he remembers. Now 22, Alain is a role model, encouraging those who have experienced similar journeys to his own to not give up on their dreams. 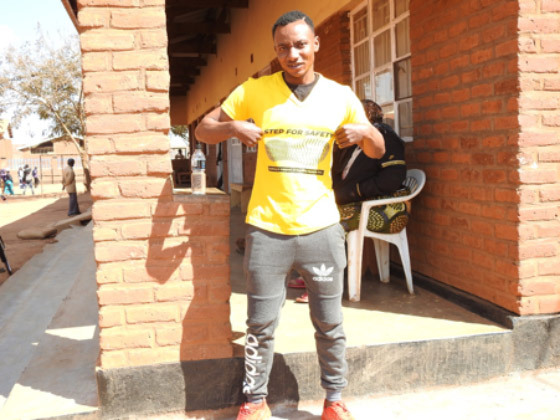 After attending an online course for a diploma in Social Work in the camp – offered by one of UNHCRs implementing partners, he has become a community leader in the camp, helping others like him find opportunities despite their hardship. When asked what Alain wants people to know about himself and his experience, his answer is a story of hope. He believes that as a young man who has developed to become a community leader despite his circumstances, he can inspire others to do the same and encourage them not to give up. Although having lived in the camp for nine years, Alain still looks back at his life in Bukavu with fond nostalgia. He remembers spending time at the lake and the Ruzizi River surrounded by red soil and beautiful views from the top of the mountains. He finds hope in the opportunity of continuing to empower himself so that one day he can return to the DRC and help rebuild his country. By participating in Step for Safety, you will be empowering young men like Alain reach their goals, acquire the strength and skills to be active members of their community.